Misha's Story . . .
Little Miss Misha is making some big strides with her comfort levels and training. Her calming supplement seems to be helping. She frequently checks in now and wants to be near her people. She’ll go outside, check for birdies and return, and happily look for a lap to sit in. She loves her foster dad and gets in his lap and squirms until she is comfy. She’s even started giving him those famous springer kisses! There is no longer a concern with letting Misha roam the house, and go outdoors when she wants or needs to. She’ll promptly come in on her own after a few minutes. Misha’s training has been slow but it’s working. Clicker training is used for teaching new commands and then gives way to praise and treats. Right now she is continuing to learn what “off” means; counter-surfing and jumping on people for attention are still common. Misha has learned the art of the Springer stink eye perfectly. She recently was counter-surfing and her foster mom gave her a firm “Off”; Misha did as she was told but turned and gave “the look” to let her foster mom know she was not happy at all. Oh, my…it was so devilish it was cute. Now let’s talk about recall. Misha does very, very well with recall in her fenced yard…even when distracted by birdies. Outside the fenced area, there are just too many exciting things to see and exploring to do. She managed to slip out of the gate one morning and had an exciting time bouncing through the wheat fields, then taking off after a seagull to the docks behind the seafood supply. When she sets off, her foster parents just follow along in the car and, when Misha stops, they call her. She’ll turn and look, making eye contact, but may or may not decide she’s ready to return home. On this particular adventure, neighbors were out and helped to keep track of where Misha was. One lady came running out of her house telling Misha’s foster mom she had seen a “giant low-flying seagull” go by. This little girl is fast! She will eventually come and sit, but much patience is required. 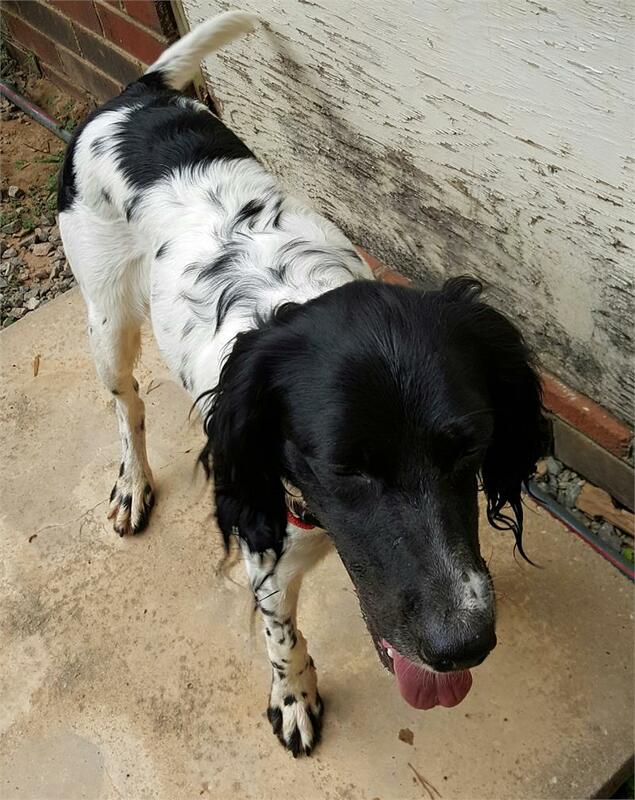 A fenced yard with a dog-proof gate will definitely be required in her forever home. Recently Misha had her spa day and got a good report from the groomer, the only exception being that she didn’t like her nails clipped. She squealed like she was being tortured. The groomer also mentioned it was evident spa days were not something Misha was accustomed to; she wiggled and squirmed, but no more than the average pup on a first trip of this kind. Misha has been a busy girl this spring. She loves being outdoors sniffing the fresh air and, you guessed it, chasing birdies. She also is learning to play with a ball. Her foster parents throw the ball and Misha will chase it. She pounces on it like she’s waiting for it to do something…like move. She’ll pick it up, run around the yard with it, occasionally drop it, and then pounce again. She is so funny to watch…silly, silly girl! Since she loves running so much, her foster parents have switched Misha to a high performance, working dog food. She’s starting to fill out a little, which is good. Previously she weighed just under 30 pounds and she’s finally made it to 31. Misha’s clicker training started out a bit rough because she was startled by the clicker. So much so that no treat was high value enough to get her attention and she ran from the noise. Things are going more smoothly now and she is mastering “touch.” Her recall is improving as well. Her foster mom is keeping stats to measure her progress; she will come reliably about 45% of the time. Some days she does great and checks out at the end of the day with 90%, other days she isn’t as consistent. One day Misha followed her foster mom on to the porch. There was a birdie on a low branch across the yard. Misha saw it and took off, suddenly stopping to sneak up on the bird. (Be very, very quiet; I am hunting birdies.) As a test while Misha was distracted by the bird, her foster mom called her…“Misha, come.” Wow! She came right to her mom’s side and sat down. Hooray, Misha! So far she’s only done this once when very distracted, but once is good enough for now. She’s come a long way since she arrived. This was cause for celebration as no one would have ever thought this would happen so soon. She’s one smart girl! During the last few weeks her foster parents have noticed some changes; Misha is waiting to go through the door when humans go out themselves. She is checking in more when left in a room or outside “alone.” And she waits her turn for treats without having to be reminded as much. Yipppeeeee!!! Speaking of outside, little Miss Misha was out on a warm day running after as many birds as she could find. She came flying in the house and stopped for a cool drink of water. When she was done, she dunked her head in the bowl, and then proceeded to splash and play, getting her foster brothers all wet in the process. “So, you’re a swimmer,” her foster mom thought. The next day Misha was taken to the pond to go swimming. However, she was not interested in getting in; she wanted to go in the other direction to see if there were any birdies in the trees. So, for now, swimming is for another time. Her foster mom is so proud of Misha’s wonderful progress. 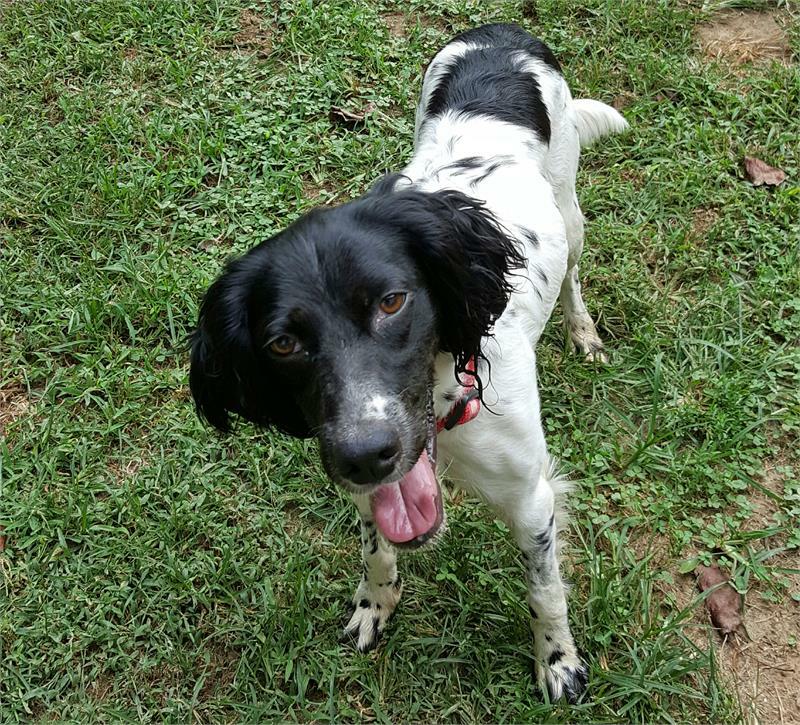 This silly bird dog is looking forward to summertime fun! Update 03/06/2017: "Misha is known as being very, very birdie!" Little Misha is adjusting in her foster home in grand fashion. After escaping from the fenced area of her yard, she gladly came when called by her foster mom. Well, Misha wasn’t happy about having to be on a leash, so she chewed it off and took off…while her foster parents were talking. She chased a hawk a few miles down the beach. It wasn’t until a neighbor passing by spotted her, stopped his car and called her that she ran to him, happily jumping in the car for a lift home. YAY Misha! Her recall is improving…baby steps for this sweetheart but progress is progress. Misha now has a newly secured fence and can run as long as she wishes. 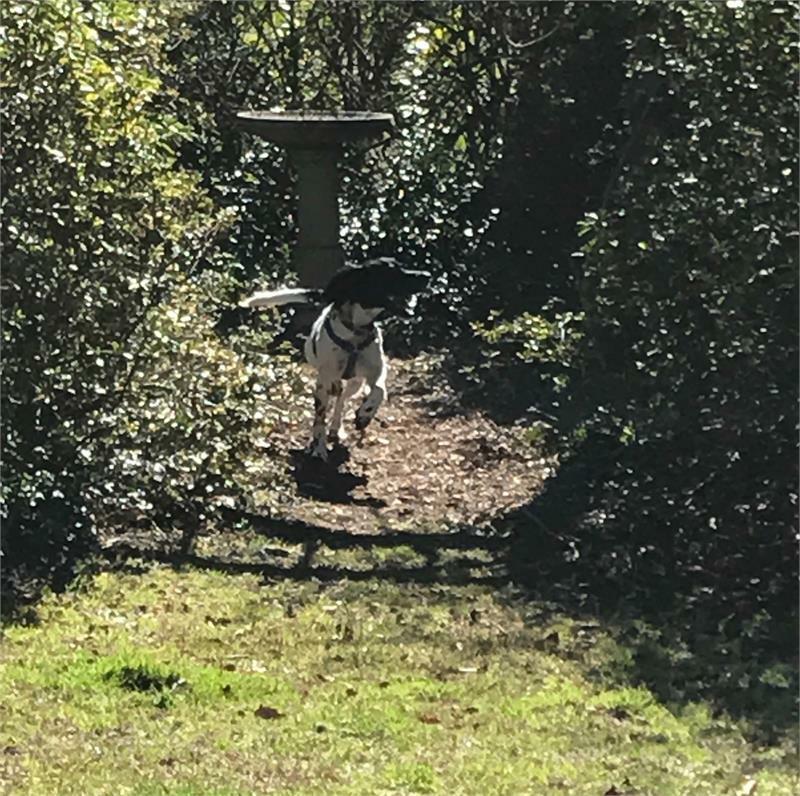 She runs so much she has worn a figure 8 path around her foster parents' bushes and trees, all the while searching for any birdies who may have made a pit stop in her yard. She has even been able to get one of her foster brothers to play along too. Misha is known as being very, very birdie! She has such a high drive to get them. Misha is also getting long walks daily. A neighbor who walks stops by and picks her up to join him. She seems to really enjoy it and greets her friend at the gate with a happy dance of jumping and spinning when he arrives. Misha is learning not to pull when on a leash and is making improvements daily. Inside the home Misha now has free roam at night and when her foster parents are out. She either sleeps on a doggie bed or with her foster parents, where ever there is an open spot. Though she cannot be left for long periods of time, a routine of going out to do her business is helping. She is now signaling it’s time by going to the door and waiting to be let out. Good girl, Misha! She doesn’t bark much but does jump to greet visitors; she stops when given a firm “Off”. Counter-surfing continues to be an issue. When will her foster mom learn she cannot leave even a head of lettuce within reach? Miss Misha is a very sweet pup who loves cuddle time with her foster dad. She gets her turn at night by sitting in his chair with him to watch some TV. She loves her bedtime treats and is eager to get hers. Her “wait” is coming along nicely. After all, she is one of 5 dogs so patience is important when getting treats. Soon Misha will start an obedience class to work on some additional skills and to learn to focus attention on her people and to improve her recall. When she has completed it, she should be one well-mannered little lady. Check back on this little gal's progress. She is a “work in progress” and very smart. Someone is going to be very lucky to call this girl their own. Update 01/27/2017: "This little girlie will need an active home where she can run, play, and get plenty of exercise. A fenced yard will be mandatory as well as some cuddle time with her humans!" Misha returned to MAESSR’s care because she just did not fit the lifestyle of her adopters. 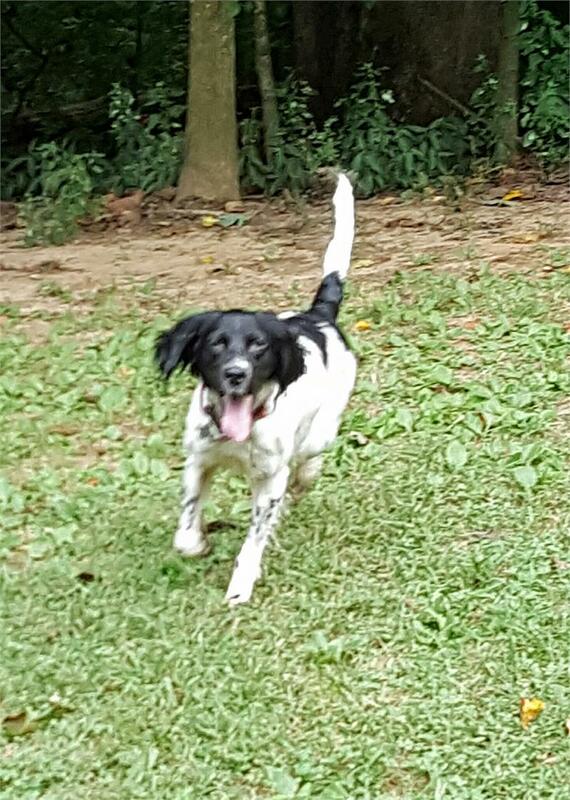 She’s a sweet ball of energy that is eager to please and loves to run. 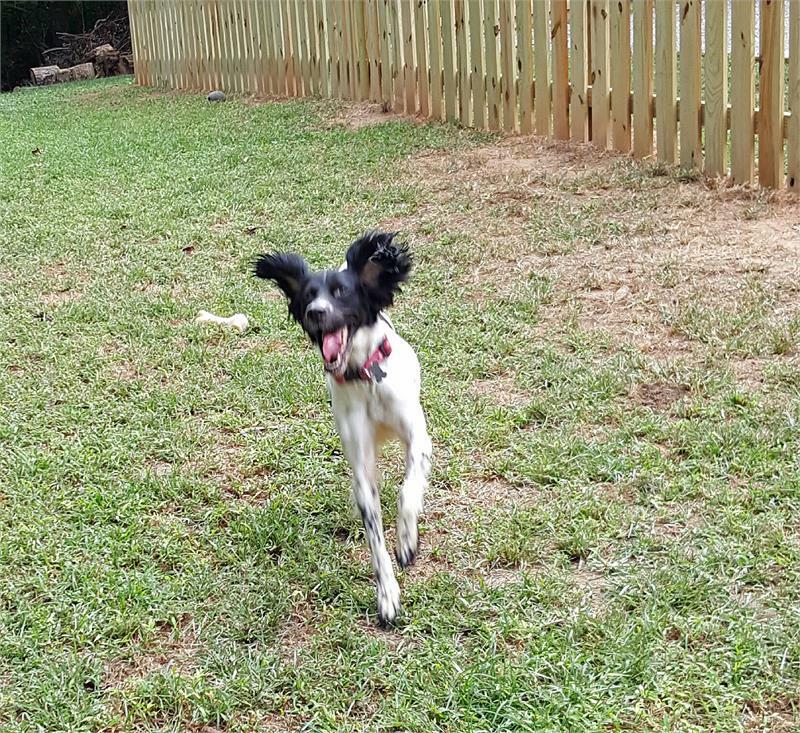 Misha is learning the routine in her foster home quickly; bedtime treats are a favorite for her and the four resident Springers. Since Misha’s foster brothers are all seniors, her foster parents decided she needed a young friend for some playtime. So, Misha and her foster parents’ grand pup are spending the days running in the yard, going for long walks, and playing with toys. Toys are abundant and Misha is getting tons of play time under her belt. After a few rainy days when spending long periods outside wasn’t possible, the two pups made up their own games and even got one of the resident Springers to join in the fun. Although Misha gets along well with all of the canines, she seems to particularly like her new pal and an older foster brother. He will participate in a game of chase with her while appearing to be “barking orders.” Misha has responded very well to this and is often seen play-bowing, trying to entice him to play. Since this bundle of energy just loves to run, run, run, she is learning to be a running partner. She and her two-legged foster sister have been running two miles each and every afternoon. Understanding that this running does not involve birdies, Misha is doing quite well with her new found skill. Running on a leash is definitely new for her but she is getting the hang of it. Yay, Misha! Misha’s also learning that counter surfing is a no-no. She’s a pro, so keeping items out of reach is important. She might be tiny but this little gal can reach her way all the way to the back of the counter tops. Any time she is in the kitchen her nose is up and sniffing for anything that has been left behind. Misha sits quietly while her foster family eats meals and doesn’t beg. Good girl, Misha! Currently Misha is taking an over-the-counter supplement to help with calming and to give her time to focus on her training. She’s pretty proficient at performing “sit” with both a hand signal and voice command. Her “come” and “off” are improving every day. Recently her foster parents started working on a “chill out” game to teach her to calm down on her own after excited play. Afterwards she enjoys some snuggles with her foster parents. This little girlie will need an active home where she can run, play, and get plenty of exercise. A fenced yard will be mandatory as well as some cuddle time with her humans! Misha and her traveling pal Carson were found as strays in North Carolina. Shelter staff quickly contacted MAESSR to get the pair into rescue and to free up needed kennel space. Now they are on their way to finding new forever homes through MAESSR. 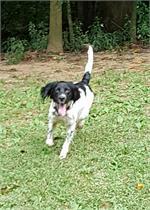 Misha is a tiny field Springer that loves to run and chase when outdoors. She is learning the ropes of inside living and definitely loves attention. It was very obvious when her foster mom first met Misha that this fieldie had not been exposed to anything, had had no training, but had an extremely good temperament. This little gal’s biggest issue at the moment is learning to take treats "EASY." Other new things are filling her days as well. She is learning to walk on a leash, to ride in the car-- basically how to do everything that a good girl needs to do. Although Misha is two years old, MAESSR is going to require two series of obedience classes for this cutie pie. This will give her a much better understanding of how good girls are supposed to act. If you are up for putting some extra time and energy into this girl, her foster mom is positive it will be well rewarded in the long run.